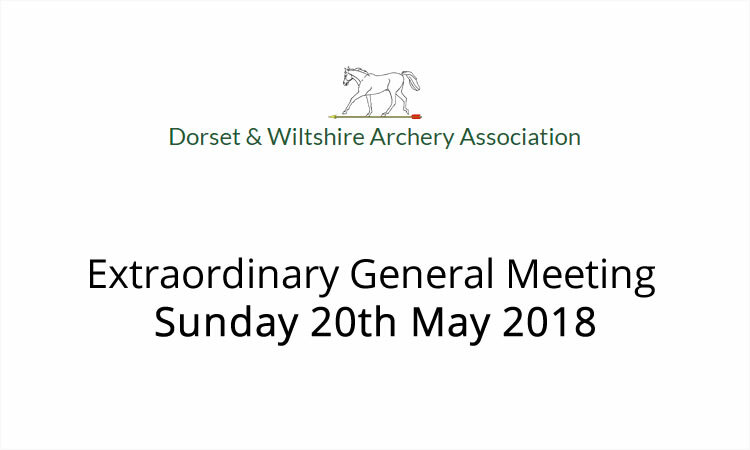 An Extraordinary General Meeting (EGM) of the Association will be held at the Tesco Extra, The Bourne Centre, Southampton Road, Salisbury SP1 2NY on Sunday 20th May starting at 1.30pm. We have the room until 3.45pm as the store closes at 4pm. In accordance with the constitution, section 18* of the Association, I hereby call an Extraordinary General Meeting to dissolve the Association due to the County’s failure to appoint key Executive Officers. It was agreed by the committee at the 10th April 2018 committee meeting to call an EGM on the 20th May to start the closure process of DWAA if no one is prepared to step forward and support the County. All club secretaries and committee members have received the minutes of the said meeting, sent on the 15th April. Chairman – This position has been vacant since the AGM 2017. Secretary – The present secretary, who stepped forward as a 6 month (only) emergency stand-in at the AGM 2017, is due to step down on the 6th June 2018. All club secretaries and committee members have been aware of this impending outcome if no support is found. There has been some interest shown, but no one has made an actual commitment. If someone steps forward, prior to the EGM, the EGM will be cancelled. There are other positions that need to be filled also, see page 8 of the 10th April minutes. A meeting of the Executive Officers will take place prior to the EGM. Secretary: Michael Vittles – standing down after 6 month emergency period. This meeting will be held purely to talk about the implications of the closure process. This will ensure that on the day of the EGM we have anticipated all points/eventualities that might arise. The future of the Association is now in your hands! NB: All club secretaries please bring this notice to the attention of your club members. *18 The Committee may, or at the request of any two members, call an Extraordinary General Meeting. The demand and reason for such a meeting shall be deposited with the Honorary Secretary for seven clear days during which time the Honorary Secretary will issue a calling notice to all Club Secretaries and Associate Members, advising them of the demand and its reason, and giving at least 21 days notice of the subsequent General Meeting.